Do you already write a blog, and do you have a heart to make a difference in the world? By joining the Gospel for Asia blogger team, you can play a vital role in helping share the love of Christ with untold millions of women and children in South Asia. So many have never heard even once of the God who offers unconditional love and true forgiveness. Your blog can be a wonderful vessel, as you allow the Lord to guide your pen. Did you know that over 50,000 female children are aborted every month in South Asia? Females are the last to eat and the most likely to be illiterate. They’re the first to work as child laborers, and sometimes even sold to become one of 1.2 million child prostitutes. As they grow up, they gain little respect. These suffering women live in the most unreached parts of the world—places that have yet to hear the name of Jesus. And many women cannot be approached by men due to cultural customs, making their slim chance of experiencing God’s love even slimmer. Gospel for Asia has a burden to reach them, and you can partner with us to make a difference. We believe that uplifting the lives of these suffering women is one of the most significant things that can come about to transform families and communities for Christ. Open a door of hope for desperate women and children in South Asia by joining Gospel for Asia’s blogging team. Through your blog, you can challenge your readers to make a difference in the lives of hurting people on the other side of the world. Whether 10 or 10,000 people read your blog, you can use your posts to inspire them. We will send you amazing stories from South Asia that testify of how God is transforming lives. Multiply the impact of your ministry to the far reaches of the world. Touch the lives of women in unreached parts of Asia no one else can reach. Replace the abuse and despair of these women with love, dignity, and economic opportunity. Help women who are faced with difficult choices, and in many cases, have no choice at all for a way out of their desperate plight. Partner today with an organization that has over 30 years of experience reaching the unreached in Asia with the love of Christ. Interested in blogging with us? Join the Blog for Asia Team. When you sign up to join the Blog for Asia team, you’ll receive access to the 40 Days of Blogging stories, a track within Blog for Asia. This set of powerful stories, photos and videos shares the plight and redemption of the voiceless and hurting in Asia. Over the course of 365 days, at your own pace, create 40 amazing posts. 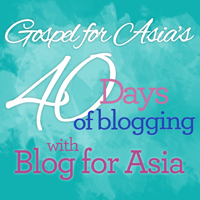 Find out more about resources you can use as a Gospel for Asia blogger in the 40 Days of Blogging track.